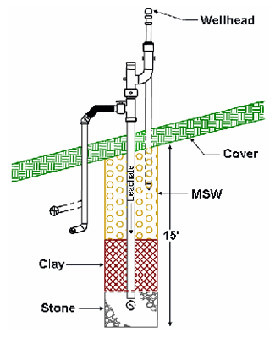 The bioreactor program began using a combined wetting and gas collection system. The two processes are performed separately using valves located at the head of each trench. The gas valves are closed during recirculation and then opened for gas collection after the trenches have had time to drain. We installed the first phase of the system in 2006 in cells 1-5 and we are still recirculating leachate into the trenches, but the gas system has been modified in order to run the landfill gas to energy project that began operation in 2011. 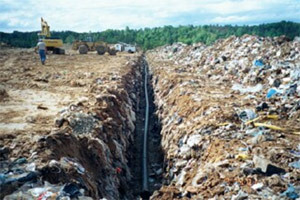 The design of the injection trenches include A 100-ft length of solid pipe to provide some distance between the pressure injection location and the sideslopes of the landfill. The wetting trench is a 3 x 3 – ft stone filled trench with a 6-inch perforated HDPE pipe. We have also used shredded tires instead of stone for a few of the trenches and they have worked well. Leachate is injected under low pressure to first fill the trench and then distribute leachate into the surrounding waste. On the side slopes we installed gravity trenches that were excavated 15-ft into the waste. The 3X3-ft stone filled trench is located at the bottom and a clay layer is used to seal it off so it can be used for gas collection. The rest of the trench is backfilled with waste. 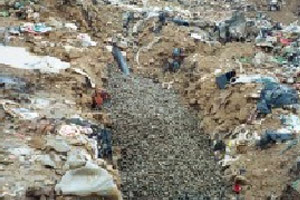 Leachate is fed from the top and is not allowed to build up pressure in the trench. Pumping ceases after the trench is filled and then leachate drains by gravity flow out of the trench. For bioreactor landfills it is critical NOT to have barrier layers so leachate is allowed to move freely through the waste without ponding. 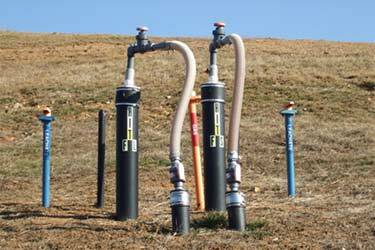 And, because our gas collection system includes the use of horizontal trenches, avoiding barrier layers is equally important for collection of landfill gas, since, just like leachate, gas does not travel well through soil barriers. The cover soils at our site have a high clay content and will form barrier layers if they are not thoroughly removed prior to placement of more waste. 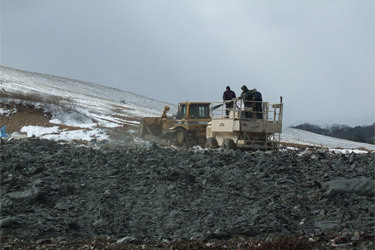 For this reason, we make extensive use of alternative daily cover at the Buncombe County Landfill. It not only saves a significant amount of airspace and borrow material but also reduces the amount of leachate seeps. This image is a perfect illustration of the process I just described. 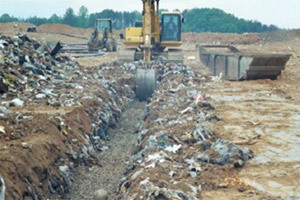 I took this photo of exhumed waste when we were drilling the gas wells for the gas to energy facility. It gave us an opportunity to see firsthand the condition of the waste in the areas of the landfill where a lot of leachate has been recirculated. 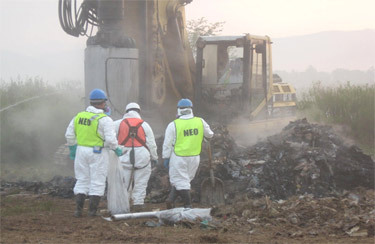 The waste being excavated from the bore hole was highly decomposed. I measured the waste temperature at 104 degrees and could see that it had a high moisture content. As the waste was exposed to the cool morning air there was steam coming off of it. So, the bioreactor project is obviously having some positive effects.